Well this just falls under the category of "I didn't think this all the way through." Tonight I received a couple of emails from the area technical school I am taking some classes from. The first one comes through with the subject line: News: Shots Fired. Yeah. That got my interest. The email was about a training video the school is working on for what to do if there is an armed intruder. This was followed a few minute by another with the same body, but the new and improved subject line of New: Video Coming Next Week. 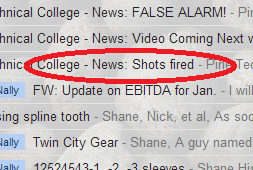 I just shook my head and said to myself don't people think that "News Shots Fired" would not be an idea subject line for a email coming from a school? I mean I am far from the sharpest tool in the shed and I know better than that. About five minutes after the second email, a third arrived with the all caps FALSE ALARM! as the subject. My guess is somebody just might have got a phone call regarding the original email. The email sent form the school tonight. It really saddens me that there are even training videos like this and active shooter drills taking place in schools these days. When I was in High School, it was pretty common to see a shotgun in a student vehicle during the fall. I remember going directly from football practice to a quick evening duck hunt and my Remington 1100 would be in my car all school day.